LATE LAST FALL THE CONANT LAND was the site for a wonderful outdoor learning experience for the third and fourth grades. Carlisle teachers collaborated with Drumlin Farm teacher naturalists on the curriculum for a full morning of outdoor exploration. CCF board members helped staff the learning stations that were created between the trail entrance at the end of the Town Hall parking lot and Castle Rock. Some of the subjects covered were forest succession, nurse logs, human impact on the natural world and adaptation. Drumlin farm brought an opossum, owl, duck and Canada goose to provide living examples of adaptation. In addition, CCF is supporting a fifth grade project involving raising Blanding's Turtles, an endangered species. Dr. Bryan Windmiller, a herpatologist, has provided the grade with four baby Blandings Turtles which they are feeding, raising and studying until they can be released in the spring. Dr. Windmiller is leading three field outings and providing three classroom presentations for fifth graders during the course of this year. FUTURE LAND STEWARDS from the Carlisle Schools explore the Conant Land with CCF Board Member Marjie Findlay. Liz Gray, one of the third grade teachers, commented, “The fall field trips to the Conant Land were a huge success! The stations led by Drumlin Farm naturalists and CCF volunteers provided a rich learning experience. The students were engaged and excited about exploring the natural world. We are so lucky that this town land is conveniently located to the school (just a quick jaunt, no buses needed).” CCF has been sponsoring “Building Conservation Communities” in the Carlisle schools for four years. ON A RAINY OCTOBER SATURDAY with a hardy group of 16 volunteers of all ages, working with loppers, clippers, swing blades, buzz saws and a chain saw, the Carlisle Trails Committee cleared a new trail, now known as Twin Peaks Trail, on the CCF-owned Benfield land on the north side of West Street. The trail access begins at West Street at the new boardwalk built by the developer of Applegrove Lane and climbs through a trail easement onto the Town-owned Bow Tie lot (recently protected as conservation land by a Town Meeting vote last spring) and then reaches the CCF property. As pictured in the map (below), there are two short loops one can take; the trails diverge just short of a beautiful vernal pool. Along the trail are dramatic boulders, signs of wildlife, and interesting plant material, as well two high points— peaks—both of which would make lovely picnic destinations. CCF and the Trails Committee would like to thank all the folks who helped clear the trail. Limited parking is available on a graveled pull off on the south side of West Street near the boardwalk entrance. NEW TRAIL, NEW BOARD MEMBERS Left, CCF board member (and Carlisle Trails Committee member) Steve Tobin posts a trail marker for the new Twin Peaks Trail on the Benfield Land (center). Right, new board members Peg Gladstone, SteveTobin, Lori Jiménez and Jamie Klickstein. At last June's annual meeting at the Harring barn on West Street, CCF welcomed four new members to its Board of Directors. Both Jamie Klickstein and Lori Jiménez grew up in Carlisle and are now raising their families here. Jamie has taken on the role of Treasurer (filling retired board member Fontaine Richardson’s shoes) while Lori, who is a lawyer by training, is an active volunteer in the school and is helping CCF with educational outreach efforts to connect children and their families to Carlisle’s open spaces. 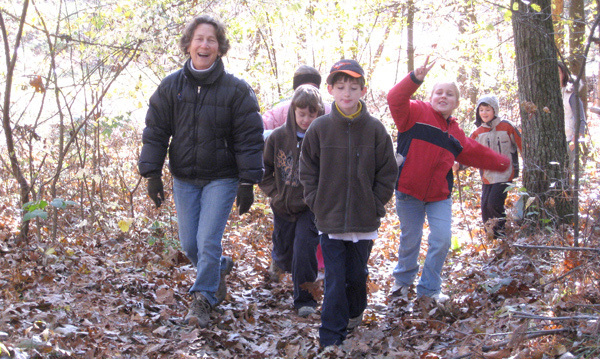 Peg Gladstone, President of the Carlisle Education Foundation, is well connected to the Carlisle school community and is a keen amateur naturalist. Steve Tobin, member and past President of the Trails Committee, knows Carlisle’s conservation land intimately. He will help CCF create trail connections and enhance its stewardship activities..
AN IMPORTANT COMPONENT OF CCF’S responsibilities is land stewardship. Over its first 50 years CCF has acquired 22 properties totaling 226 acres and been granted conservation restrictions on another 16 properties covering 417 acres. In November, CCF board members walked several contiguous CCF properties and inspected CRs along the western corridor of Carlisle. FINDING THEIR WAY CCF board members Marjie Findlay, Steves Tobin, Hinton and Spang, and Jay Luby confirm the locations of various property boundaries and connections..